your spouse has said to you in no uncertain terms that s/he wants to get a divorce and it appears as if s/he really means it. It wasn't just said in the heat of battle. You and your spouse are separated physically. You and your spouse still live together but have very little to do with each other. You may be sleeping in separate rooms, have virtually no communication, and little or no sexual contact. Your spouse has filed for divorce. Sometimes a spouse has left and they are not thinking clearly and need to wake up to the reality of who and what they are leaving behind. This 3 step method is for the spouse who is determined to bring their wayward partner home. It is not meant to manipulate anyone. It is simply a way to pick yourself up and draw the lost partner home while maintaining your dignity. Doing the opposite of what you may be doing in order to get a different result is important especially if what you have been doing isn’t working. If you are struggling with bringing your spouse home please contact us. We want to help you through this. If you need clarification on anything we have written please call us and we will sort out your concerns. Once you have stopped the pursuit, it gives the distancing partner the ability to turn around and begin pursuing YOU. The second step, Getting a Life will help you to get on your feet and be stronger. When we talk about getting a life, we are NOT talking about the bar hoping, club going, night life social scene. That has proved to be much more destructive. Getting a life means you are setting goals and taking action on quality hobbies like pottery making, painting classes, joining a soccer team, taking up long distance running, singing in a choir, sewing, game night with the men or women at your church, joining a small group at church, volunteering for an organization you feel passionate about, coaching your kid’s little league team, reading fun books, just something that is wholesome and mind-consuming. Last but not least, Watch & Wait, this is where you do just what it says. When you Stop the Pursuit and Get a Life you have to Watch & Wait to see what happens. There are 3 things that could happen through this process. The first nothing happens, the second is that s/he might start showing more interest in you, your whereabouts, and what you are up to in your life, and third they could have an overnight change of heart. Be loving in return, but not overly excited or enthusiastic. Do not ask any questions about your future together. Be vague when asked about the changes in you. Say that you have been thinking things through. Do not say, "I love you." Resist getting into conversations about your marriage. Beat your spouse to the punch when it comes time to leave or separate from each other at the end of the activity. You set the tone for going your separate ways. 2nd scenario: If your spouse is becoming curious then the idea is to be responsive to your partner’s new interest but not overly responsive. If you over due it then they will get cold feet. If you get excited that the technique is working share it with a friend, run around the block, journal about it but don’t wear your emotions out in the opening. Wait and be patient. Michele Weiner-Davis, says it best, “You need to stay interested, but cool, until you are absolutely convinced that your spouse's renewed interest in saving your marriage has taken hold. Once you feel absolutely sure that this is so, you can test the waters by becoming more obvious about your desire to stay together. You can try discussing your future together and see what happens. 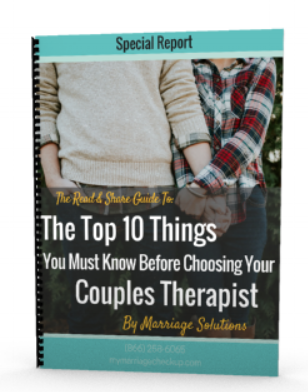 If your spouse is receptive, you can continue to move forward slowly and begin to tackle the issues that drove you apart in the first place. If, on the other hand, you're met with reluctance, backpedal just as quickly as you can." 3rd scenario: They could have an overnight change of heart and abandon the idea of divorce all of a sudden. This is possible but highly unlikely. If this does happen then advance slowly. If you jump ahead too quickly and act like nothing happened then its a matter of time before things end up where they were before with the ‘D’ word back on the options table. Remember: you didn’t get to this point in your marriage over night and you certainly won’t get out of it over night. You must proceed forward slowly and cautiously and still keep up some of your “Get a Life” interests. If you have been separated don’t jump into being together with each other all the time. If you have been emotionally miles apart, don’t abandon all of your other interests to be with your partner every waking moment. It could take weeks or months to see if the reconnect feelings are still there. Until then you need to patiently let the reconnect feelings grow.